My colleague Colin Wolfgang recently addressed the perceived shortcomings in Pres. Obama’s foreign policy, many of which speak to legitimate concerns. He suggests that the Obama administrations failures on foreign policy have not come from policy itself, but a lack of clear vision for America’s position in world affairs. Yet in doing so, he uttered a telling phrase about Obama’s “inability to project American dominance on the rest of the world in the same way his predecessors have done before him.” This history of American power projection and its detrimental effect on America’s credibility, coupled with the changing nature of the global balance of power, have resulted in the Obama administration’s current perceived inability to negotiate a better position for the United States. The administration’s policies, however, reflect both the wishes of the American citizenry and a new paradigm in international relations, one that places primacy not on power but on peace, not on the winning of wars but the avoidance of war by other means. Pres. 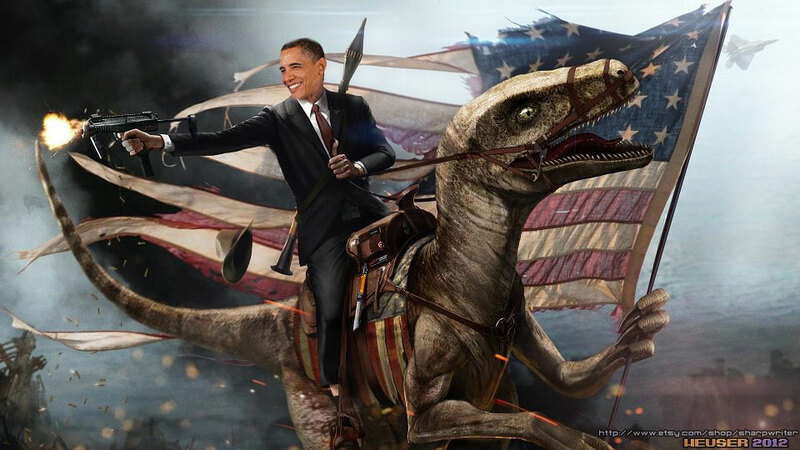 Obama riding a velociraptor. Because reasons. As he took office in January 2009, Pres. Obama was faced with a global financial crisis largely brought on by the policies of prior administrations, two unpopular and unsuccessful wars in the Middle East, and an increasing threat of Islamic extremism throughout the world. Despite these obstacles, for many observers Pres. Obama’s first term was a success in terms of his foreign policy initiatives, and foreign policy was considered one of his strengths vis-à-vis Mitt Romney in the 2012 election. He oversaw the final withdrawal of US troops from Iraq, established a timeline to wind down the Afghan war, attempted to close down Guantanamo Bay, and pursued a policy of limited drone warfare against terrorist groups. As his second term dawned, however, increasing political violence in Iraq clouded the success of troop withdrawal, a political stalemate with the Afghan government hindered the creation of a comprehensive transition plan, Guantanamo remained open (and still does), and the policy of drone warfare came under fire as the civilians affected by drones as well as drone operators spoke out about the program’s human costs. Yet while these policies were apparently failing under the watchful eye of the administration, the foreign policy events that the Obama administration receives the most criticism for in the media were largely surprises that stemmed from external events. The Arab Awakening surprised even most leading experts on the Middle Eastern and North African countries where uprisings occurred, and the tumultuous process of democratization has left the US with little leverage to ensure transitions continue peacefully. In Egypt, where the US has the most leverage because of military aid, the interest in geopolitical security rather than the autocratic policies of the military have overridden American desires for democracy. History dictates that the US needs a stable Egypt to ensure a stable Middle East, especially on Israel’s borders. While it is possible to escape this legacy, it will take decades, not presidential terms, to do so. The civil war in Syria and the resulting humanitarian crisis are also areas where the Obama administration has waffled on policy, largely because the crisis escalated quickly and the administration had not fully articulated any sort of framework for dealing with a Syrian civil war. Believing that the Assad regime would never do so, Obama issued his infamous “Red Line,” suggesting the use of chemical weapons would trigger American intervention. As so many military experts have written, however, even in the horrific case of chemical weapons use in August 2013 (not to mention the cases of 160,000 Syrians who have been killed by mostly conventional means in the conflict), an armed American intervention could make things much worse rather than better. The Russia-Ukraine dispute and the annexation of Crimea is another point where commentators like to remark on Pres. Obama’s weak policy. Given the options available, however, Obama chose the wise course of diplomacy, sanctions, and international pressure over destabilizing and dangerous armed standoffs or military exercises. Russian President Vladimir Putin’s ability to project strength did not prevent the Ukrainian government from throwing out his lackey, Pres. Viktor Yanukovych, and electing a new government. While control over the country’s Eastern provinces remains tenuous amidst (allegedly) Russian-backed uprisings, the result has surely been more positive than if Pres. Obama had pursued a more bellicose policy with America’s longtime adversary. While the policies of the Obama administration are derided as isolationist, in many ways he is simply acting on what the American people elected him to do. A recent Pew Research Center poll shows that more than half of Republicans and Independents and 46 percent of Democrats think that the US already does “too much” to solve world problems. Perhaps even more significant, for the first time in 50 years, more Americans (52 percent) think that the US should “mind its own business internationally” than do not. In the face of a stagnant economy, war weariness, and a general feeling that even positive and well-meaning interventions come back to haunt the United States (Afghanistan, anyone? ), pursuing more interventionist policies would likely garner more political ire than the administration’s current “quasi-isolationist” policies. I agree with Pres. Obama that the use of military force has been proved at best sporadically effective when dealing with international issues. The diplomatic policies pursued by the State Dept. during his tenure, while lacking the satisfying sound of boots on the ground, have preserved a relative peace for US troops and civilians alike. He chose to participate in armed intervention in Libya wisely, and perhaps even more wisely avoided it in Syria and Ukraine. If what Pres. Obama’s critics are looking for is action, there are a few areas where he can pursue his current policy of diplomacy over intervention and still have concrete results to show for it. He can take a firmer stance on Syria not by sending troops or weapons there to do battle, but by creating a coalition of nations to fully fund the humanitarian efforts of the UN and other agencies. By providing the civilians caught in the crosshairs with the minimum amount of aid requested by the UN, the administration can help to ensure that the 10 million displaced Syrians internally and externally do not become a lost generation, a permanent refugee population, or a breeding ground for terrorists. If the administration wants to go a step further and actually put military equipment to use, it could institute no-fly zones over transit areas to ensure displaced Syrians safe access to refuge, aid, and medical care. In Ukraine, the Obama administration can also pursue non-military aid to signal to Russia that it does not intend to become militarily involved unless necessary, but that the US places high priority on Ukraine’s democratic success. This will also go further to alleviate the current economic strains experienced by Ukrainians than bombing Eastern cities to rid them of combatants ever could. The changing nature of geopolitics means that America is no longer the only bully on the playground. Rising superpowers like China and Russia have freedom of action that is unprecedented since US independence. International pariahs like North Korea and Iran do as they please not because of their growing power but because of their lack thereof, and constitute equally unnerving threats to stability. By reorienting US foreign policy away from military intervention and towards successful cultivation of diplomacy, international agreements, and enforcement power for those agreements, in the coming decades US presidents can pursue policies that cultivate lasting peace rather than continual armed intervention and conflict. Speaking on behalf of the war weary, that sounds like a worthy long-term goal for what is still (but might not always be) the most powerful nation on earth.